In the present era when shared parenting is becoming more widespread, this issue will be important to increasing numbers of parents, whose decisions will potentially have consequences for increasing numbers of children. However, the empirical research base upon which policy makers, practitioners, and parents can draw is thin. The present study was designed to add to that base. In the initial study (Solomon & George; 1999a), researchers recruited families with infants who averaged 16 months old. Those who provided at least one overnight with father per month formed the Overnight group (44 mothers and 22 fathers) and those who provided at least one daytime visit with father per month but no overnights formed the No Overnight group (49 mothers and 17 fathers). Infants were assessed in the strange situation with each parent at least one month apart. The distribution of attachment classifications was not significantly different in the Overnight group compared to the No Overnight group, for either mothers or fathers. Thus attachment appeared to be unaffected by presence or absence of overnights. Nevertheless, given a non- significant trend (p = .10) for Overnight mothers to have fewer secure and more disorganized or unclassifiable attachments than No Overnight mothers, the researchers proceeded to test whether two sets of factors were related to attachment specifically within the Overnight group. 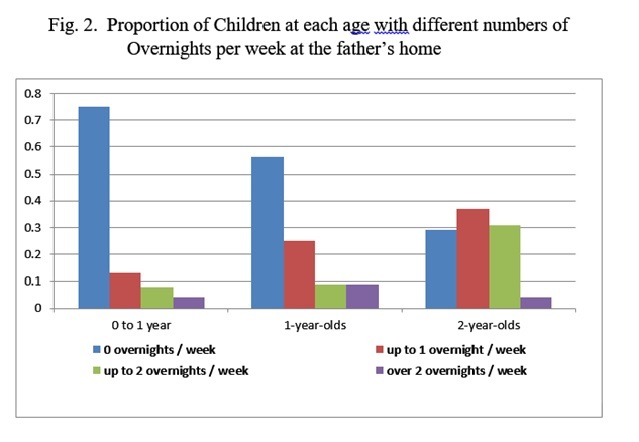 In Figure 1 (shown here as 1a, 1b, 1c, and 1d), the first set included eight measures of overnight stays reported by mothers (e.g., longest number of consecutive overnights per month, total number of overnights per month, how long the child had been overnighting, etc.). As Solomon & George (1999a) stated, any effects of overnights “should be more pronounced the longer and/or the more frequent the overnight separations are and the earlier such arrangements are put into place” (p. 5). However, none of these factors was related to attachment classifications for either mothers or fathers, providing additional evidence that attachment was unaffected by the duration, number, history, etc. of overnights. The second set of factors (in Figure 1), included the mother’s “psychological protection” (i.e., her report of how well she adapted the visitation schedule to infants’ needs and responded to any increased clinginess or anger during transitions), the mother’s mental health, and the mother’s report of the parents’ communication and conflict. The authors reasoned that overnights might make mother-infant attachment security susceptible to deficiencies in each of these factors. In their words, “risk [to attachment security in the Overnight group] may be potentiated and maintained by adverse conditions, or … may under supportive conditions, be prevented” (p. 5). If true, then these factors should relate to infant- mother attachment only, or especially, in the Overnight group as opposed to the No Overnight group. Parent conflict showed the predicted effects. In the Overnight group, mothers of insecurely attached infants reported significantly more parent conflict than mothers of securely attached infants, and in the No Overnight group attachment security was unrelated to parent conflict. Parent communication was not significantly related to attachment in the Overnight group (p = .09), although the means for both groups were in the predicted directions, and there was no evidence of overnight susceptibility to mother’s compromised mental health or psychological protection. For fathers, better mental health, more communication, and less conflict in combination with overnights might have been expected to facilitate secure attachments, but none of these three factors predicted secure attachment to fathers more so in the Overnight group than in the No Overnight group. In sum, the initial study provided limited evidence for effects of overnights on infant-parent attachment. Out of 13 analyses for mothers, there was one significant finding (overnight susceptibility to parent conflict) and two non-significant trends (susceptibility to poor parent communication and fewer secure attachments in the Overnight group). Out of 12 analyses for fathers, there were no effects associated with overnights. The paucity of effects could be due to the fact that few infants were securely attached to either mother or father in any group (including the Married group) and the rates of disorganized and unclassified attachments were abnormally high, prompting the researchers to caution that “this unanticipated finding clearly requires replication” (p. 15). The authors suggested that their recruitment procedures might have yielded an unrepresentative sample, because 86% of the fathers and 33% of the mothers in the Overnight group, and 100% and 9%, respectively, in the No Overnight group were under restraining orders, the rate of formal mediation was seven times the normal rate for that county, and the rate of parents’ participation in psychotherapy was high. There was evidence of beneficial effects of overnights for the 0- to 3-year-olds on only one subscale (Social Problems);  i.e., both parents reported that children with overnights showed fewer social problems, neither parent’s ratings differed for younger and older groups of children, and fathers’ ratings showed an advantage of overnights after controlling for parent conflict, negative changes in the father-child relationship since the separation, and child age. Thus, in Pruett et al. (2004) infant overnights were significantly associated with one benefit for children’s behavior, while in Solomon & George (1999a) they were significantly associated with one cost to infant-mother attachment, but both studies yielded mostly null findings. As part of a report commissioned and published by the Australian Government Attorney-General’s Department (McIntosh et al., 2010), researchers examined the Longitudinal Study of Australian Children, in a national random sample of parents, for associations between overnights (‘sleepovers’) and numerous child health and behavioral outcomes in infants (under 2) and young children (2 to 3). This study also controlled for family socio-economic status, parenting warmth, hostility and anger toward the child, and parent cooperation and conflict. In an advance over the two earlier studies, children were divided into three groups; 1/. daytime-only contact “no overnights”, 2/. moderate number of overnights, and 3/. high number of overnights. These three groups are potentially more informative than just two groups, because they allow a test of the linear effects of the hypothesis; i.e., the more overnights, the greater the effect. To underscore the point about no linearity, one has to point out that there were no comparisons made between children who never overnighted and those who overnighted 1-4 nights (infants) or more than 9 nights monthly (toddlers) This means there is no way to know if there was any linear relationship at all on any of the outcomes for no overnights and “some” overnights. This is important and it should be pointed out by everyone in the debate since many, i.e. McIntosh and her fraternity, makes a great deal out of “even just one” weekly overnight stay saying it is bad for infants, toddlers, and their mothers. She can’t make that claim because she never made that comparison. In that were the case, there should be significant differences in the same direction between the day-only group and the moderate group, and between the moderate group and the high group. Two types of non-linear, threshold effects could also result from overnights, one in which only the high group showed elevated levels of an outcome variable, and one in which both the moderate and high groups showed equivalent elevated levels – but these would require special explanation. 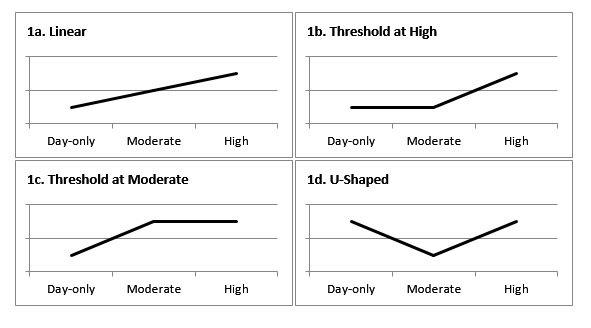 Finally, the U-shaped effects, in which the day and high groups show similar elevated levels in comparison to the moderate group, would also require special explanation because that would suggest unique effects of moderate numbers of overnights, which none of the researchers has postulated. For infants under 2 yewars of age, there were no linear effects. There were U-shaped effects for infant wheezing and irritability, in which the day-only group and high groups had similar elevated levels over the moderate group, but the authors offered no explanation for unique, beneficial effects of moderate number of overnights. Interpretation of the findings for “visual monitoring of the primary caregiver,” which the authors took to indicate anxiety about the primary caregiver’s emotional or physical availability, is problematic because this outcome variable was composed of three items  from two subscales (Eye Gaze and Communication) of the Communication and Symbolic Behavior Scales (Wetherby & Prizant, 2002). This instrument assesses the infant’s readiness to learn to talk, wherein higher scores indicate greater readiness. None of the items reference anxiety about the availability of the caregiver. The “visual monitoring” findings resembled Figure 1c, but interpretation is not possible because validity for only these three items has not been determined. The other three outcome variables for infants under 2 showed no relation to overnights. At ages 2 to 3 (the ‘toddler’ age range), the only outcome variable that showed the predicted linear relation between more overnights and more behavioral difficulties was persistence. For, quote ‘problem behaviours’, the relation resembled the elevated problem behaviors associated only with a high number of overnights. By contrast, the two child health variables (wheezing and global health) showed that more overnights were associated with better health. Wheezing and global health were not significantly different between the three groups, i.e. daytime-only contact “no overnights”, 2. moderate number of overnights, and 3. high number of overnights. The other three outcome variables at ages 2 to 3 showed no relation to overnights. In sum, out of 13 analyses, one showed the predicted linear relation indicating that more overnights were associated with reduced infant persistence, one showed that only high numbers of overnights were associated with more infant problem behaviors, two showed benefits of overnights for 2- and 3-year-olds’ health (wheezing and global health), two yielded ambiguous effects (U-shaped effects for infant wheezing and irritability), six showed no effects, and one was not interpretable (“visual monitoring”). Thus, two analyses showed benefits associated with infant overnights, two showed costs, two were ambiguous, and seven yielded either null findings or findings that are difficult to interpret. A recent study by Tornello et al. (2013) used data from the Fragile Families and Child Well-Being Study. This is a large national data set collected in 1998 to 2000 but the parents were not representative – they were, in the sub-sample constructed by Tornello and her colleagues, almost all unmarried and most were racial/ethnic minority and low-income status. While the sample could be pedantically considered ‘ideal’ for detecting effects of overnights according to Solomon & George’s (1999a) hypothesis that overnights leave children more susceptible to other family stressors (of which these fragile families had many), it represents a false dawn. The results cannot be generalised to the general population or to divorced parents since their motives, values, and lifestyles are so different . The researchers categorised children between the ages 1 to 3 into groups analogous to the 1. no overnights, 2. occasional overnights and 3. no overnights based on the mothers reports over the past three years. Outcome measures included mothers’ responses about their children at age 3 on a shortened and modified version of the Attachment Q-set (Waters, 1995) that was constructed specially for the Fragile Families Study, and mothers’ reports of children’s adjustment using the CBCL at ages 3 and 5. Control variables included mothers’ depression and their relationships with the fathers. These concessions to Fragile Families concerning mothers’ depression (far higher in this sub-set) and their relationships with the fathers (frequently far worse in this sub-set), shortened and modified questionnairres, underlines the earlier statement that the findings cannot be generalised to the general population. There were no linear effects of overnights at age 1 or at age 3 on mother-child attachment security. There was only a U-shaped effect of overnights at age 1. Some of those who overnighted the most frequently were NOT more likely to be insecurely attached than those with no overnights. The authors of the Australian and Fragile Families studies do not offer an explanation for the U-shaped pattern. A relevant factor might be the fact that the frequently overnighting/sleepover groups at both ages included children who spent up to 70% of overnights at their fathers’ homes. This is important and maNY have not even noticed that data. Following the authors logic, since the mother is no longer the primary residential parent in these atypical families, their hypothesis would dictate that these children’s secure attachment should be to their fathers, i.e. their primary parent. Of the 14 analyses of children’s adjustment, there was one threshold effect in which overnights at age 3 were associated with more positive behaviors at age 5. In sum, as with the previous studies, the findings are contradictory (one beneficial effect and one ambiguous effect) and limited (14 analyses showed null effects). The conclusions that can be drawn from the limited and contradictory findings to date are further constrained by the narrow focus on infancy and early childhood. We learn from researchers as diverse as Patricia Morgan and John Bowlby that ‘outcomes’ exhibited in teenage years have precious little relevance to the effect of events in the early years, i.e. 1 to 4 years old. What is really sought is the long-term outcomes of infant overnights – especially for children whose parents were married and living together when they were born. In other words several longitudinal studies would provide the needed data. The US and UK have such longitudinal studies (see work published by Kathleen Kiernan, formerly of the LSE) and Patricia Morgan (also of the LSE), has drawn on that data to demonstrate outcomes among teenagers and young adults (“Farewell to the Family ?”). In the current context of the heightened debate over child custody policy, information is needed sooner by policy makers, practitioners, and parents. While that is being compiled decisions will have to be based on data from overlapping fields such as that used by the LSE lecturers mentioned above and by pertinent research already on file e.g. by Civitas, Bristol Family Trust etc. Kelly & Lamb, 2000; Lamb & Kelly, 2001; Solomon & Biringen, 2001; Warshak, 2000. Garber, 2012; Hyman, 2012; Lamb, 2012; Ludolph, 2012. McIntosh, Smyth, Kelaher, Wells & Long, 2010; Pruett, Ebling & Insabella, 2004; Solomon & George, 1999a; Tornello, Emery, Rowan, Potter, Ocker, Xu, 2013. The meaningful comparison is the Overnight group to the No Overnight group, not the Overnight group to a Married group that the researchers also recruited. The latter confounds effects due to divorce with effects due to overnights. However there is a problem in interpreting this finding because from the authors’ description (on p. 43) it appears that the Social Problems subscale was given only to the older children – it would appears as if Pruett didn’t have any children aged under two years old. Whilst the researchers did compare the moderate group to the high group, for reasons unexplained they did not compare the day group to the moderate group. Instead they compared it to the high group. One is forced then to base one’s characterisation of the pattern of their findings on the results of the two comparisons they did test. Quote: “When this child plays with toys, does he/she look at you to see if you are watching?” “When you are not paying attention to this child, does he/she try to get your attention?” “Does this child try to get you to notice interesting objects – just to get you to look at the objects, not to get you to do anything with them ?